Since 1990, we are located in Kembs, although desservsi by bike, near the Grand Canal d'Alsace near the locks and not far from the small Alsatian Camargue. At the restaurant "locks" our cuisine focuses on fish revisited with local dishes such as fresh salmon and smoked variegated by us on sauerkraut sauce roasted caraway or lasagne of frog and salmon cubes to the pot herbs cream . Meats are also present on the card. In the summer, we welcome you to our quiet garden terrace. 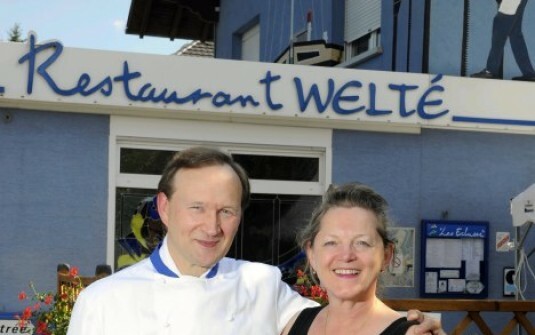 Bertrand Welté, chef, was trained by the greatest of French cuisine as Jo Rostant (La Bonne Auberge in Antibes), François Bise (Auberge du Père Bise to Taloires), Pierre Gaertner (Aux Armes de France Ammerschwihr ) ... He fell early in the pot, with restaurateurs parents that he gave helping hands in his youth. Our chef has traveled extensively in the hexagon but also internationally: in Cairo, Egypt, in Anguilla in the Caribbean, in Edinburgh, Cologne, Geneva ... His experiences allowed him to acquire a knowledge and to offer you today dishes with wife exotismes.Son notes Maria Theresa ensures the reception and customer comfort.